I have a plant that sits in a vase full of water. It’s a great plant for me because it does not require any soil. Just water. So I look at it sitting in its little vase and smile, because I don’t have to worry too much about killing it. As long as it has some water, things are okay. 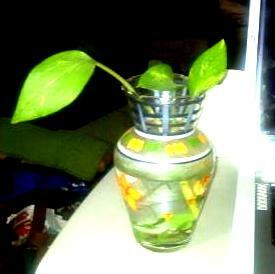 A couple months ago, I washed out the vase and put in fresh water. While I did, I noticed that the plant had not grown in quite awhile. I had hoped that more leaves would be growing out of the vase by now, but nope, just the same original one and a small offshoot that had been there for months. Still green. Still pretty. Just not growing. At first I thought I was imagining things. Surely the plant was growing, but with my lack of plant expertise I just wasn’t noticing. But no. It was pretty clear that the plant was not growing. Then I thought, well, at least I haven’t killed it. That’s a good thing. Good, but not satisfying. I wanted my plant to grow. So a couple weeks ago I bought a small box of miracle grow. I carefully mixed the powder with fresh water and replaced the water in the little vase while I watered my other soil-grown plants. Overnight my plant looked healthier. And it has been growing ever since. Not only have the two existing leaves grown, but a third leaf has sprouted and is threatening to out-grow the first two. I wish my faith would grow as quickly and easily as this plant. In my arrogance, I thought it was. I felt strong and healthy. God and I, we had things under control. But then suddenly I hit a wall. Something happened that frustrated me and instantly brought back feelings of despair, bitterness, anger. I’m upset with myself. And I’m ashamed to admit that I’m upset with God. Aren’t we past this God? Haven’t we worked on this? Haven’t I asked for your healing in my heart? How can one small thing so instantly shake me? I feel like I’ve been running and running only to realize that I’m actually on a treadmill, stuck repeating the same three or four steps over and over. I’m so frustrated! I want to be better than this. I’m sick and tired of my emotions and feelings being so easily swayed. I want fresh water full of nutrients. I want to grow. We are so thankful for how you and your Sweetie long to be all God wants you to be. But did you notice that your plant just patiently waited until YOU gave it nutrients? “Be still, and know that I am God” – maybe God is saying I do not want you to worry about “growing” right now, but simply wants you in HIS presence, loving and enjoying HIM every moment of evey day. I’ve found that there is an intresting power in Praising Him. God has you where He wants you to be, for right now. Enjoy Him in it and at the right time HE will move you on. Your comment has really comforted my heart today. Thank you. And there is a lot of truth in what you say. I struggle with impatience and often need to remember to just be still and trust that God is God. But, there are also times when I am reminded of how black my heart can be. When I think I am trusting God until suddenly something small that should not concern me starts an emotional downward spiral. That is what I am tired of. I’m tired of being so up and down, emotionally and spiritually. But maybe the answer still is to just be still and know that He is God. I’m going to be chewing on this more. I was just telling Scott that I was missing your comments on the blog. And then this morning, here you are! Love you. Reminds me… I need some miracle grow for my plants right now. And for myself.